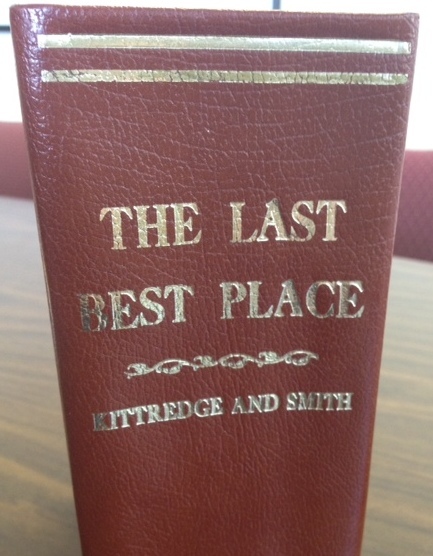 The phrase, “The Last Best Place” has been associated with the state of Montana for decades. Last week, the U.S. Patent and Trademark Office passed a provision permanently denying any trademark application for the slogan. Democratic Senator Max Baucus has been pushing for the block, saying the term should belong to all Montanans. The Last Best Place first started gaining traction as the title of a 1988 Montana anthology. It’s this really thick collection of stories released in conjunction with Montana’s centennial in ’89. Editors William Kittredge and Annick Smith worked with multiple groups to assemble this book, The Montana Historical Society, the Arts Council, Humanities Montana and others. Historical Society Spokesman Tom Cook says everybody was sitting up at Big Sky trying to think of a name. And it took off from there becoming synonymous with Montana’s wide open spaces. It appears in other books and songs. The state Tourism Office used it in a campaign and so did Hillary Clinton. “By holding the last primary, the Last Best Place is going to help choose the next President of the United States,” said the 2008 Democratic Presidential Candidate at the annual Mansfield-Metcalf dinner in Butte. A lot of Montana businesses use the phrase too and in 2001, one of them tried to trademark it. Nevada businessman David Lipson sought exclusive rights to “The Last Best Place” for his Paws Up luxury ranch resort. Paws Up sits in Montana’s Blackfoot River Valley. Lipson would also use the phrase for a line of products like cookwear and clothing. The New York Times reports Republican Senator Conrad Burns was the first to introduce legislation to prevent Lipson from trademarking “The Last Best Place” in 2004. Baucus took that a step further, banning the U.S Patent and Trademark Office from spending any money or resources to trademark the term for anyone. But that provision was included in a federal budget bill, and so it had to be re-approved every year. Senator Baucus strengthened that language again a couple years ago, seeking to make the ban permanent. Representatives for Paws Up or David Lipson did not respond to requests for comment. That same New York Times article says legally banning a trademark on a phrase is extremely unusual. So Montana, Big Sky Country, The Treasure State secures to its list one last best nickname.